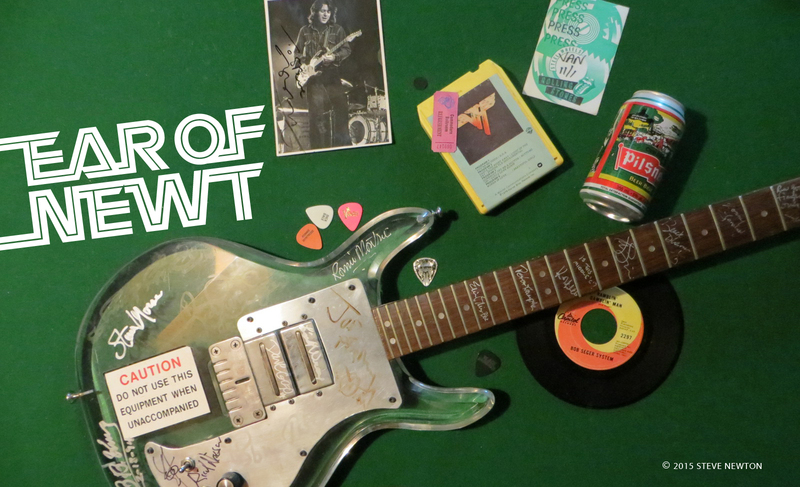 The liner notes to Squeeze’s new live album, A Round and a Bout, contain a precise itinerary of the 892 concerts that the band has performed around the world since forming in ’74. There are early shows at the Camden Girls School and after that the venues get steadily more impressive–culminating in four shows at Madison Square Garden in New York. Singer-guitarist Chris Difford says those concerts “were like the equivalent of getting into the World Cup and playing at Wembley”. In the past 16 years, Squeeze has taken its slyly tempting brand of pop-rock from the famed Marquee Club in London to the Opry House in Austin, Texas; from the Sundowner Hotel in Sydney, Australia to the Jamaican Sunsplash Festival. And the band will bring it to the Pacific Coliseum on Friday (May 25) as the opening act for Fleetwood Mac. Squeeze may just blow Stevie Nicks and her soft-rock compadres right off the stage. One familiar face in the Squeeze lineup will be missing this time around, however. Julian (Jools) Holland, the hammy keyboardist whose zany antics and versatile chops have helped propel the band from the beginning, has left the fold to pursue the TV career that he first got a taste of as co-host (with saxman David Sanborn) of the Sunday Night music show. More recently Holland has been pursuing TV stardom in the U.K.
Difford says that even though Holland chose the tube over Squeeze there are no hard feelings. His departure is looked upon as more like another chapter in the eventful history of the band rather than a loss to be mourned. While Holland’s effortless humour will be missed–“He’s Tom and Jerry,” quips Difford–don’t expect Squeeze to lose its ability to knock out delicious pop melodies and cheeky observations of the human condition. The songwriting core of Difford and fellow singer-guitarist Glenn Tillbrook is still intact, and their clever work can be heard on the live album in songs like “She Doesn’t Have to Shave”, “Black Coffee in Bed”, and the gorgeous pop gem, “Pulling Mussels (From the Shell)”. Unfortunately, since the band wasn’t performing “Another Nail in my Heart” on the tour from which the live album was culled, that similiarly infectious track doesn’ t show up. But life goes on. The last time Squeeze played Vancouver was at the Orpheum in January of ’88, when the group was conducting its own tour. But even though the band’s been around quite a long time, Difford says he doesn’t mind being billed as the opening act. “There’s always good and bad points about supporting,” he says, “and you take the rough with the smooth. I mean, we only have a 45-minute set to do, which isn’t too much work, really, considering we used to play for two-and-a-half hours. “But I am quite excited about touring with Fleetwood Mac–I used to enjoy them when I was at school, the very early albums with Peter Green. And also Christine [McVie] Perfect–she had her own sort of blues band that played locally. 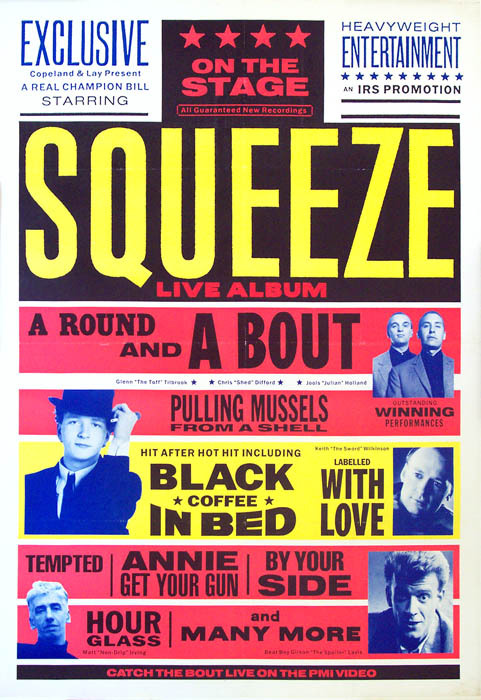 Although far from being one of the world’s best-known bands, Squeeze has managed to maintain a loyal following in several countries–no mean feat when you consider how fickle and trend-conscious people can be. But the music has always been the magic of Squeeze–image and glamour are not its calling cards. The average Squeeze fan might not even know which of the singers is Difford and which is Tilbrook–and probably doesn’t care, as long as they keep coming up with tunes like “Tempted” and “Hourglass”. Difford agrees that the band has escaped pigeonholing. One change that Squeeze will be going through in the near future concerns its record company. The band is currently at work on material for a new album which will be its first release on the American giant Warner Bros.
On the band’s current 12-week North American tour, Scottish keyboardist Matt Irvine will be taking over Holland’s spot, and Squeeze will be raking up more gigs, on the way to its landmark 1,000th show. Difford claims that he can remember practically every concert the band has done, for some reason or another. He graciously points out that they haven’t all been Madison Square Gardens. Dumb mutt. Must have been a Milli Vanilli fan or something.